Young Charlotte and her mother (who is dying of breast cancer) get a new person in their house all of a sudden- a person (Eddie Murphy) who comes as a cook, but soon turns into the caretaker of their life. He has been hired by the mother’s ex lover for cooking as long as she lives and that means an expected six months. After that Henry Church (Eddie) will get financially free due to a large monetary settlement he will get for working those six months. . But six months turn into six years and the mother is still holding on, though she has weakened down. And the amazing thing is- Henry does not show an ounce of desperation for being free from his commitment and being able to go his way. Instead he relishes coming and helping these people and he also likes making delicious dishes for them to savour. It is obvious that he is doing so and feeling so because he has no family to call his own. Charlotte has already gone from resenting this black man’s presence in her life to depending on him for everything. And she wants to know more about him, where he goes after he completes his job in their house and where he lives. But that is one topic which rouses the wrath of Mr Church like nothing else. He is not ready to discuss that . Years pass by and the mother dies; but not before she has had the joy of seeing her daughter go to dance with the best looking guy in school at prom. The scenes of caring for her as she nears death were agonising for me to watch- brings the spectre of similar scenes witnessed in personal life. I was shamelessly waiting for the mother to die so that my agony could end. Charlotte (played by Britt Robertson) who has grown up has no money to continue her education but Mr Church is again the angel of her life- he has saved money from coupons which her mother gave him and thus the education is funded. But she wastes her college opportunity. For she is the daughter of a mother who was free enough to give birth to her outside wedlock. And like mother like daughter, one day Charlotte arrives at Mr Church’s door pregnant . As he opens his heart wide enough to take care of her, her curiosity in his life increases. Why does he go at night to some nightclub? Why does he come home drunk blabbering to himself? What is his past and has something dark happened to him in bygone years that he lives all by himself without woman or family just taking care of her? And this leads to confrontation that nearly costs Charlotte her baby’s life. But as the years roll by, she has to come to terms with the fact that the answers to the questions in her mind are not important and they may never be answered; that she should be thankful for having such a father figure in her life. And like a daughter takes care of her father, she will be called upon to take care of him in old age. 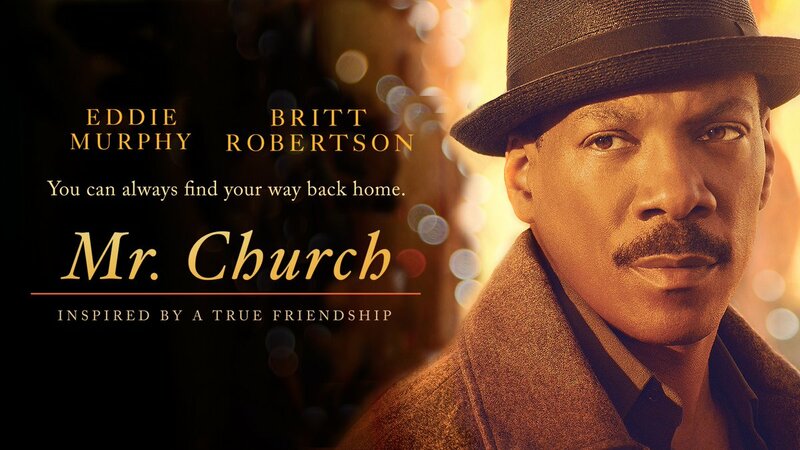 As Mr Church slid towards a dignified journey towards mortality, this time death was not agonising for me to watch. I was just wrapped in the sentimentality of the scenes and just was not able to stop a tear from coming my eye. Both Eddie Murphy and Britt Robertson do justice to their roles and music and photography and colours are appropriate for the situations. There is case for saying that the character played by Eddie Murphy is shown only through Charlotte’s eyes and his feelings and his life (which doubtlessly had an unhappy past) are not shown. But isn’t it better to remember that he redeemed it all by helping another family survive? P.S. Random fact. Having divorced parents increases the chance of divorce risk manifold for the children, more for daughters than sons.